Hello Party Folks, hope all is well in your neck of the woods. I haven't been able to finish any of my projects lately, due to either human error or tool malfunctions. I have been spending a lot of time with my bestie, which just makes me happy. Please link up as much of anything as you would like and please follow me via Linky Follwers, I promise to follow back! I've even include a couple features from last weeks party. Enjoy and Party on! Bestie is coming over today, so fingers crossed I will have a completed project to share tomorrow! Yep, it's one of those days. Lucky for me I have some Ben & Jerry's in the freezer. I shared some with the boy, but I think there is enough left to get me through today. I really wanted to report that I finished the tray table, but I haven't. I finally got the print out to transfer, and my new heat transfer tool didn't work. It would have been wise to try it on a piece of scrap wood, but no I tried it out on the tray. Two more coats of paint later and some sanding to get rid of the bubbles...it's back to normal, just not finished. I'm thinking of just stenciling it and passing on the graphic idea all together. Yes, I'm a quitter. No, I'm not proud. It is what it is. Here's what my kitchen looks like right now. I decided since the tray wasn't working out for me I would work on my 'new' dining rooms chairs. Let me tell you, it's just not my day. The rest of the mess, it's all over the kitchen. It doesn't help that my new office is at the kitchen counter, I get to see it like this until Tuesday. Sigh. Enough of the whining. Here's a pic of my big baby, Stanley. He's growing so fast, I just love him, especially when he isn't using my arm as a chew toy. He's lost all his baby teeth but it still hurts. My real baby boy is star of the week this week at school, which means homework for mom. I'm just glad the teacher gave me a week to do it. I had to get photos printed out and it took a week to get them, of course I could have gotten them sooner. I just didn't feel like going to Walmart to pick them up. I had them mailed to me. Love the way I colored it? The boy hates to color, so I was alone. Notice the pink sheet of paper? I have to write him a letter for his folder at school. You know, the one where you tell them why he's special and he get all embarressed in front of his class...yep that one. Notice I haven't started on it, but it's not due until Monday, so I have till the last minute Sunday to write a tear jerker...lol It's good to be Mom! Last but not least, my sample of Coco came in the mail. Thanks Robyn Story Designs!!! You guys are amazing. However, the sample board is actually making my decision harder. I love all the samples they mixed, and it doesn't help that they did both with clear and dark wax. I see dark wax in my future. I wish I could have a can of every ASCP color, but I need to narrow it down. Could I have been more random? Probabaly, I just wanted to share what was going on around here, and not getting done. Hope you are having a wonderful weekend! Please party your hearts out and share as much of anything as you would like, I love seeing what everyone is up too. I've actually been working on stuff too and I got to party this week. Weird? Also I have the new Linky Followers on my side bar, I would love it if you followed me with it, and I will follow all of you back! When hubby was home last month we went to New Hampshire to visit his Mom and two of his Brothers. It was a short visit, but so nice to see everyone. Especially my Brother in law Gene, he's amazing, and totally gets me. He took us out to this very cool store, called Oldies to shop, and in my case to spend. I bought this beautiful tray table, well the shape and size were beautiful. Great shape and size, not so great look. The mostly after. lol Still need to do the graphic on the top, but it's been painted and the details have been added. So, graphic and wax is all that is left. Colors are ASCP Coco and Martha Stewart Vintage Gold. Totally addicted to the gold! I found the graphic, but of course I don't own a laser printer. I forwarded it to a friend that is gonna print it out. Thanks Mrs. Designer Garden, you rock! Lauren's Make Under got a Make Over! I'm crazy like that, seems like I never finish a room. It's just in transition until I make the next change. Please tell me I'm not alone in this insanity. So you know I made some changes to Lauren's room, preparing for the day when we rent it. Then I went out today while the kidsa were at school and found a couple things I couldn't live with out. Really it was life or death. I found this adorable chenille beadspread when I was out, 20 bucks! Sold. The real shocker, it's WHITE! I'm so scared of white, I need to be medicated to be in the same room with it! I love it like this, but every little girl likes to have her 'stuff' on her bed. We aren't starting the house search until May. I'm taking a break from it. It'll just give me that much more time to get the house ready to rent and start packing it up. I'm going to be doing some purging, the plan is to have some stuff in my Etsy shop by the end of the week. Fingers crossed. Here's the before of Lauren's room. Green and lavendar walls, with a lavendar ceiling. This piece was definately a 'Labor of Love', as in I love my girl so much the labor was worth it! I wouldn't have done this piece for anyone else, and I will be thinking long and hard before I strip this much paint again. lol Did I mention it was worth it? I sound like a huge whiner. Before. Lauren is the only cute factor. I can't believe it's party time again. The weeks are really going by fast. Hubby had a great visit, I can't believe it's been 30 days already. He flies out Tuesday, but he'll be back for Christmas this year. We will actually get a holiday with him! I actually got two projects done this week, but you have to wait till tomorrow and Thursday so see them. I'm gonna go watch TV with my boys, and enjoy Hubby's last night, it's technically Monday. I prep the party the night before. Happy Valentine's Day, I hope it's filled with Love and chocolate! Party on! I'll see you tomorrow with some goodies! 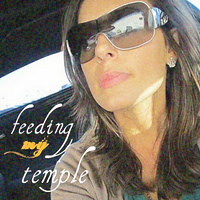 This weeks lovely guest is Allison from Feeding My Temple! Thanks Allison for taking the time to visit with us! As a full time working mom who loves to cook, I tend to be exhausted by the time Friday evening rolls around. One of my fail proof recipes that I find myself craving are these waffles. Who doesn’t like breakfast for dinner? You, of course need a waffle iron for these and use just a few of your pantry staples. This recipe takes about the same amount of time to mix as a pre-made chemical laden one. In a medium bowl, combine flour, sugar, baking powder, and salt. In the center of the bowl, make a well for the wet ingredients. In a small bowl, combine eggs, milk, oil or butter, and vanilla until egg is beaten. Pour wet ingredients into the well you made and stir until slightly lumpy. Spray heated waffle iron with non-stick cooking spray and drop 1/2 cup waffle batter into the center and close. Your waffle iron might call for a smaller or larger amount of batter; just follow your iron’s directions and adjust accordingly! Once cooked through (a green light comes on when my waffle is ready), remove and top with butter, syrup, fruit topping, peanut butter, whipped cream, or whatever you like on your waffles. Enjoy with milk. I like mine with a touch of butter and light syrup and a generous sprinkle of cinnamon. Also, have you heard about the upcoming Find Some Love Fest? Grab the button and meet back here February 1st! I'm a big fan of before and afters, love them really, but it's the during that is UGLY! Really ugly. First you clear out the room. My little helper picking up misc toys that ended up under bed and desk. She even dressed for the occasion. Then you put all the stuff in the loft and master bedroom, cause where else would you put it? The only cute factor, so far. The are pretending to have a garage sale. They are my kids. So there you have it, the during, pretty ugly huh? I can't wait to show you the after! Hey there strangers! I know I've been missing in action a lot lately. Sorry about that. I know you all understand. Hubby has been home and we've been enjoying our precious family time. Plus the never ending house hunting and unexpected trip to NH. This week we've all been sick. The kids have double ear infections and I had the flu with a sinus infection. That's how we roll. We like to do things big. We are all finally on the mend, now fingers crossed Hubby doesn't get sick before he flies out Tuesday. I know what a bummer, he flights out on Valentine's Day. Oh well, not complaining, we had a full month together. So on to the good stuff. We actually painted the kids bath this week. Miracle right? We start on Lauren's room tonight, so I will have another reveal soon. Crazy right? The Winner is Kimberly from The Brown Eyes Have It!!!! Congrats Kimberly, I can't wait to see which design you pick!!! Thanks to Michelle from Shabby Creations for offering this amazing give away to my readers! Hubby is still home visiting, and we've only got two things on my to do list to finish, and we've actually started them. Yep painting. I still have to finish Lauren's armoire, but every time I go to paint some one gets sick. Lauren was sick for three days, and now Connor is sick. Needless to say I'm not getting any sleep and the Hubby is getting sick, and I've felt better. We've finally found 'the' house and our offer has been accepted and we have a closing date! Miracle, really. At one point I was getting my teeth cleaned and the hubby was blowing up my cell phone with listings he wanted to see. Apparently I left him home alone too long. Sigh. So, as promised, here is a pic of the house. It's from the web listing, so there is no snow. Actually it looks even better in the listing, everything is alive and green. One of the best features, it's on a cul-de-sac. Love me a cul-de-sac. It's also the first detached home I've ever owned as an adult. I've always lived in town homes. 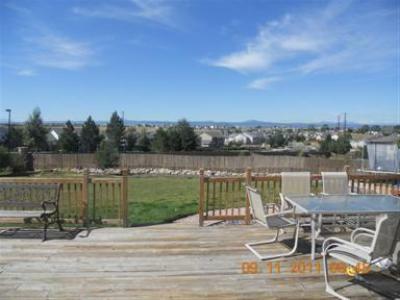 Another amazing selling point, the massive back yard with MOUNTAIN views! Stress has set in, now we have two houses...fingers crossed we rent the current house to great people. Oh, and I get to move by myself! Designer Garden has promised to help...love me some Mrs. Designer Garden!!! wink wink!!! Okay, shutting up now. Enjoy the party, thanks for the support. Tomorrow I will be announcing the winner of my Shabby Creations give away, you still have today to enter! Just another day in the neighborhood(s), that is driving all over them looking for 'the' house. At this point I'm not sure if 'the' house exists, or that any one wants to sell us one. We put an offer in a house last week and pulled out this week. They had weird demands, and really it came down to it's a short sale and the current residents don't want to move out anytime soon. Put it this way, they were hinky. Moving on, we have continued to search and we have put in another offer....sigh...It's stressful and I'm tired. I want to point out, that I was not hugely disappointed about the first house not working out, but if this one doesn't work out, it's gonna hurt. I REALLY like this one. 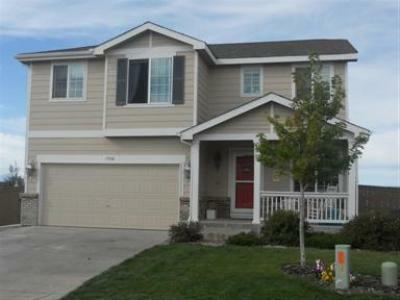 It wasn't an option at first, cause it was under contract until three days ago, and it just came back on the market. Valentine's Day is coming up, and all of you have been creating, and I've been house hunting. However, I did decorate. That counts for something? Maybe? Thanks for putting up with me. I know I owe you some real crafts and paint projects. If our offer is accepted, I'll post pics of the house, for now, I'm gonna enjoy the Hubby. We've only got 12 days left. He leaves on Valentine's Day, bummer. I knew if I just told you I painted something, you would be like, Proof! I don't blame you really, I've been not to pretty good about doing anything lately. It needs a second coat and then I have to bust out the gold paint and pretty it up, and wax...but hey, it's a complete first coat. Tomorrow Hubby and I start painting the rooms upstairs. He changed his mind and wants to do it himself. Really he just doesn't want to pay any one else, I'm good with that!